Offering you a complete choice of products which include double girder eot crane and double girder cranes. 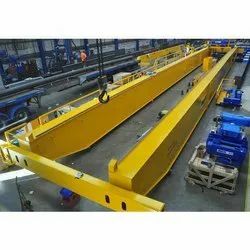 We are among the prominent organizations engaged in manufacturing and supplying superior quality Double Girder EOT Crane. These hoists are used for material handling and are best suited for both medium and heavy duty operations. These kind of Cranes are generally used when heavy loads and wide spans are needed. These double girder EOT cranes are widely used in lifts, hoisting, cross & long travel speeds to suit the client's requirement. We offer Double Girder Cranes which are well recognized for delivering high quality operations in given usage areas.The forged steel and wheel assemblies also ensure smooth movement of these Double Girder EOT Crane even over rough surfaces.